Is America really in decline? Where on earth is the United States headed? Has it lost its way? Is the Obama effect, which initially promised to halt the souring of its global image, over? More seriously, is it in some sort of terminal decline? Has it joined the long historical list of number one powers that rose to the top, and then, as Rudyard Kipling outlined it, just slowly fell downhill: “Lo, all our pomp of yesterday / At one with Nineveh and Tyre”? Has it met its match in Afghanistan? And has its obsession with the ill-defined war on terrorism obscured attention to the steady, and really much more serious, rise of China to the center of the world’s stage? Will the dollar fall and fall, like the pound sterling from the 1940s to the 1970s? It is easy to say “yes” to all those questions, and there are many in Latin America, Europe, the Middle East, Asia, and in the United States itself, who do so. But there is another way to think about America’s current position in today’s mightily complicated world, and it goes like this: All that is happening, really, is that the United States is slowly and naturally losing its abnormal status in the international system and returning to being one of the most prominent players in the small club of great powers. Things are not going badly wrong, and it is not as if America as becoming a flawed and impotent giant. Instead, things are just coming back to normal. How would this more reassuring argument go? Well, we might start with a historical comparison. In about 1850, as the historian Eric Hobsbawm points out in his great work Industry and Empire, the small island-state of Britain produced perhaps two-thirds of the world’s coal, half its iron, five-sevenths of its steel, and half of its commercial cotton cloth. This extraordinary position was indeed abnormal; that is, it could not last forever. 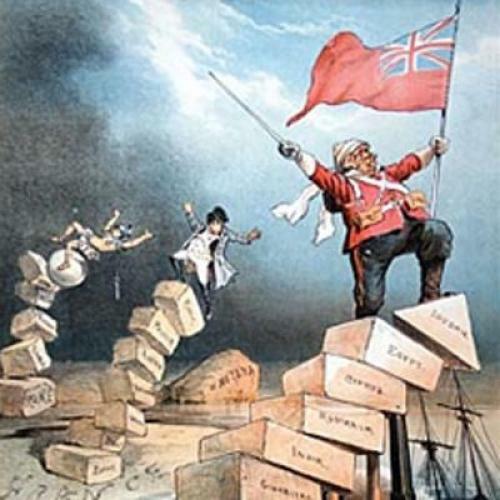 And as soon as countries with bigger populations and resources (Germany, the United States, Russia, Japan) organized themselves along British lines, it was natural that they would produce a larger share of world product and take a larger share of world power and thus cut Britain’s share back down to a more normal condition. This is a story which economic and political historians take for granted. It is about the tides of history and the shifts of power that occur when productive strength moves from one part of the world to another. It’s actually a sensible way of thinking about history over the long term. So why should we not look at America, and America’s present and future condition, in the same calm way? It is of course a much broader and more populous country than Britain was and is, and possesses far more natural resources, but the long-term trajectory is roughly the same. After 1890, the United States had slowly overtaken the British Empire as the world’s number one by borrowing critical technologies (the steam engine, the railway, the textile factory), and then adding on its own contributions in chemical and electrical industries, and blazing the way in automobile and aircraft and computer hardware/software production. It was assisted by the good fortune of its geographic distance from any other great power (as Britain was by its insularity), and by the damage done elsewhere by World Wars I and II (as Britain was by the damage done elsewhere by the Revolutionary and Napoleonic wars). By 1945, therefore, America possessed around half of the world’s GNP, an amazing share, but no less than Britain’s a century earlier when it held most of the world’s steam engines. But it was a special historical moment in both cases. When other countries began to play catch-up, these high shares of world power would decline. In the American case, we might tease out this argument by returning to a point made almost 20 years ago by the Harvard scholar Joseph Nye, that America’s strength and influence in world affairs was like a sturdy three-legged stool; that is, the nation’s unchallenged place rested upon the mutually reinforcing legs of soft power, economic power, and military power. In all three dimensions, Nye suggested, the United States was comfortably ahead of any other competitor. Global shares of relative strength were being diffused, perhaps, but in no way enough to shake America’s dominant role. How does this assessment look today? Of the three legs to Nye’s stool, soft power—the capacity to persuade other nations to do what America would like—looks the shakiest. This is not a measure of strength that can be computed statistically, like steel output or defense spending, so subjective impressions enter into the debate. Nevertheless, would anyone dispute the contention that America’s ability to influence other states (such as Brazil, Russia, China, India) has declined during the past two decades? When Nye wrote, he pointed to the significance of popular culture (Hollywood, blue jeans), the dominance of the English language, the increasing standardization of U.S. business (from chain hotels to accounting rules), and the spread of democracy, all as signs of America’s influence. Those were interesting thoughts, but we have since seen that radical students from Ankara to Amsterdam can still wear blue jeans but demonstrate against the United States, and that it is quite possible that a totally free voting system in (say) Egypt, Saudi Arabia, and China would lead to parliamentary majorities highly critical of Washington’s policies. The Pew Foundation’s regular poll of global opinion suggests diminishing approval of America, despite a short-term upward blip in favor of Obama. Soft power comes and goes very fast. As to the weakening of the second leg of the stool, America’s relative economic and foreign-currency heft, well, a person would have had to have been blind and deaf not to observe its obvious deterioration in recent years. If anything surprises me, it is how fast and how large the relative weakening has been: A truly competitive great power should not have its trade deficits widening so fast, nor its federal, state, and municipal deficits ballooning at such a pace, literally, into the trillions of dollars. It is unsustainable, although that fact has been obscured by the thousands of American economists and investment advisers who emit positive noises to their clients and who themselves simply cannot think strategically. The collective folly of portfolio advisers is compounded by the current congressional baying for China’s currency to get stronger and stronger and stronger. Is that what the United States really wants—to get relatively weaker? At a certain stage in the past 500-year history of currencies and power, the Dutch guilder hustled the Spanish escudo off the scene; then the pound sterling hustled the guilder (and franc and mark) off the scene; then the dollar hustled the pound off the scene. What is Washington risking as it presses for a stronger Chinese currency? My apprehension is that it risks a much stronger Chinese political influence in the world. America’s military strengths are, by contrast, still remarkable; at least this one leg of the stool is sturdy. But how sturdy? Well, almost half of the world’s current defense expenditures come from the United States, so it is not surprising that it possesses a gigantic aircraft carrier Navy, a substantial Army and Marine Corps that can be deployed all over the globe, an ultra high-tech Air Force, and logistical and intelligence-gathering facilities that have no equal. This is the strongest leg of the three. But it is not going unchallenged, and in several regards. The first is in the rise of irregular or “asymmetrical” warfare by non-state actors. Anyone who has seen the recent award-winning movie The Hurt Locker, about the U.S. Army’s uncomfortable and bloody experiences in Iraq, will know what this means. It means that the narrow streets of Fallujah, or, even more, the high passes of the Helmand mountains, equalize the struggle; high-tech doesn’t quite work against a suicide bomber or a cunningly placed road mine. General Patton’s style of warfare just doesn’t succeed when you are no longer running your tanks through Lorraine but creeping, damaged and wincing, through the Khyber Pass. Sophisticated drones are, actually, stupid. They help avoid making the commitment to winning on the ground, and they will eventually lose. Secondly, there is the emergence, along the historical pattern of the rise and fall of the great powers, of new challenger nations that are pushing into America’s post-1945 geopolitical space. Putin’s Russia is clawing back its historic zones of control and, frankly, there seems little that Washington can do if Belarus or a kicking-and-screaming Latvia is reabsorbed by the Kremlin. India is intent on making the term “Indian Ocean” not just a geographic expression; in ten or 20 years’ time, if its plans are fulfilled, it will be in control. Which is rather comforting, because it will thwart China’s purposeful though clumsy efforts to acquire much-needed African mineral supplies. But China, in its turn, and through its very new and sophisticated weapons systems (disruptive electronic warfare, silent submarines, sea-skimming missiles), may soon possess the capacity to push the U.S. Navy away from China’s shores. Like it or not, America is going to be squeezed out of Asia. Overall, and provided the gradual reduction of America’s extensive footprint across Asia can occur through mutual agreements and uninterrupted economic links, that may not be a bad thing. Few, if any, Asian governments want the United States to pull out now, or abruptly, but most assume it will cease to be such a prominent player in the decades to come. Why not start that discussion now, or begin a rethink? American hopes of reshaping Asia sometimes look curiously like former British hopes of reshaping the Middle East. Don’t go there. Finally, and most serious of all, there is America’s dangerous and growing reliance upon other governments to fund its own national deficits. Military strength cannot rest upon pillars of sand; it cannot be reliant, not forever, upon foreign lenders. The president, in his increasingly lonely White House, and the increasingly ineffective Congress, seem unable to get a harsh but decent fiscal package together. And now, the Tea Party nutcases are demanding a tax-cut-and-spend policy that would make the famous Mad Hatter’s tea party itself look rather rational. This is not a way to run a country, and especially not the American nation that, despite its flaws, is the world’s mainstay. This is worrying for its neighbors, its many friends and allies; it is worrying for even those states, like India and Brazil, that are going to assume a larger role in world affairs in the years to come. We should all be careful to wish away a reasonably benign American hegemony; we might regret its going. But the ebb and tides of history will take away that hegemony, as surely as autumn replaces the high summer months with fruit rather than flower. America’s global position is at present strong, serious, and very large. But it is still, frankly, abnormal. It will come down a ratchet or two more. It will return from being an oversized world power to being a big nation, but one which needs to be listened to, and one which, for the next stretch, is the only country that can supply powerful heft to places in trouble. It will still be really important, but less so than it was. That isn’t a bad thing. It will be more normal. Paul Kennedy is a professor of history and director of international security studies at Yale University. He is the author of The Rise and Fall of the Great Powers. This article ran in the December 30, 2010, issue of the magazine.